Painting of Grandfather Tupule holding his grandson Kalai in Heaven. I don’t feel I have the proper words to articulate the sadness I feel for the Poloa family who lost their little 19month old Kalai this last week. I’ve known the Poloa family my whole life. When my mom was birthing me and my twin brother Miriama Poloa (Kalai’s grandmother) came to our house to cleaned and care for my 7 older siblings. They lived across the street from us and we grew up playing with the Poloa kids (Kalai’s aunts + uncles). I remember Tupule (Kalai’s grandfather) teaching me how to smoke a pig in a hole dug in his back yard and he let me put the apple in its mouth. I remember eating the best food at the Poloa house and feeling so loved by each of the Poloas. I grew up admiring the extremely giving and generous ways of their family. They wouldn’t even think twice before giving someone the shirt off their back. I admired the Poloas so much that I did multiple school reports on America Samoa and begged Tupule to speak Samoan all the time. The last time I saw Tupule before he died was in the LDS temple. I ran into him and Miriama, dressed all in white, and was embraced by the biggest hugs. I love and admire them so much! This last week the Poloas woke up to the most devastating news. Their little grandson, nephew, and son had passed away in his sleep. This is my worst nightmare and I can’t even imagine the pain. When I found out Kalai had died I wanted to paint a painting for their family but didn't feel like I could with four young kids. My brother thought I should paint for them but again I didn't think I could find the time. 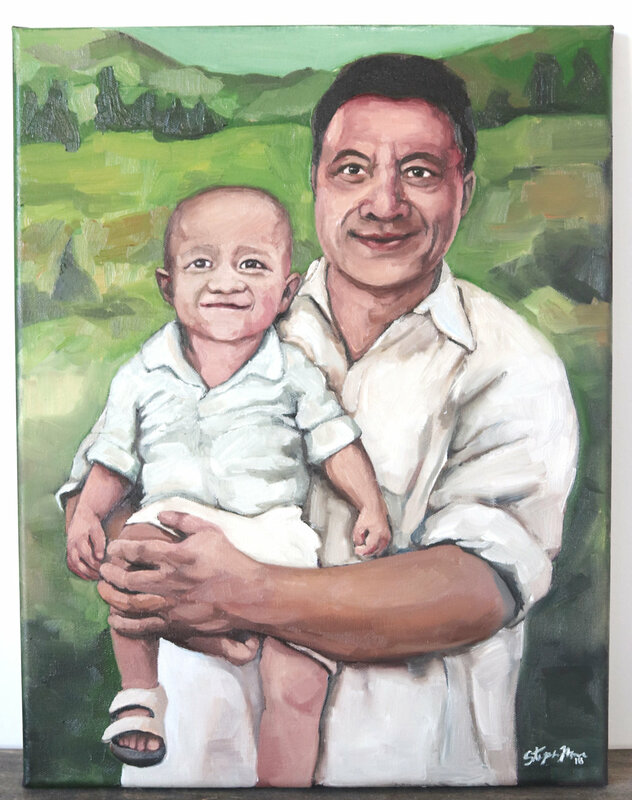 A few days later my mom called and said, "I know this is a lot to ask but I will watch your kids if you will paint the Poloa family a painting." I was so happy she offered I got to work. Kalai Tupule Poloa was named after his grandfather, Tupule, who passed away the year before Kalai was born. The only thing that brought their family hope during this difficult time was the idea of Papa Tupule Poloa holding their little Kalai in Heaven. Something I KNOW Tupule is doing till Orlando and Wendy have the opportunity to finish raising him. I love how my mom, Liz Jensen, connects the way Kalai looks to Orlando (Kalai’s dad) as Orlando looked to his own dad Tupule growing up. Now Kalai is in his granfather's arms looking up to him. This is my parents and I giving the painting and poem to the Poloa family. My heart is broken for the Poloa family and I know these next feel weeks and years are going to be so difficult. When I think about the loss, I feel humbled and realize how insignificant a painting is compared to a life. I feel there is little I could ever do to ease this burden. We have been praying for them and continue to pray for them. I pray Christ will ease their pain and give them comfort to their heart. “In light of what we know about our eternal destiny, is it any wonder that whenever we face the bitter endings of life, they seem unacceptable to us? There seems to be something inside of us that resists endings. “Why is this? Because we are made of the stuff of eternity. We are eternal beings, children of the Almighty God, whose name is Endless and who promises eternal blessings without number. Endings are not our destiny. “The more we learn about the gospel of Jesus Christ, the more we realize that endings here in mortality are not endings at all. They are merely interruptions—temporary pauses that one day will seem small compared to the eternal joy awaiting the faithful. I too am grateful for my Heavenly Father that has a plan for each of us. I believe death is not the end. I believe each human on earth will live beyond the grave. I believe Kalai is with his Grandpa Tupule and his Savior Jesus Christ. I know Christ is the only one who can extend the healing love needed to get through these painful and terrible tragedies in life. I also believe the pain of loosing a child, a pain I don't even understand, never leaves a mother or father but becomes a part of their identity just as the child is. We pray for and send our deepest love to the Poloas. I painted this painting with Oil Paint on stretched canvas. I prepped the canvas with a dark acrylic before painting with oil on top. The dark under coat makes the colors pop more, especially white. Oil paint is slightly translucent and when painting directly on the white canvas the white can show through making the colors look darker to the eye. I always add a dark coat of paint to my canvas before I paint with oil. Then I work each section adding the darkest colors before adding lighter colors on top. It makes the colors richer. Painting a dark under color when oil painting makes the whites more vibrant. With this painting I worked from four different pictures I found of the Poloa family. I used a picture of uncle Phil holding Kalai along with a face of Kalai and two head shots of Tupule. The mane picture of Phil holding Kalai was in black and white and I was painting it in color. It was hard to paint the hands without a good reference picture with color. I had my family praying for me and what I feel like is help from God to do what I thought I couldn't. Painting this from black and white to color was a challenge.